This premier optical profile inspection system combines accuracy and precision with a fast, easy to use operator interface. The OASIS operates by casting a "Shadow" of a part to be inspected and capturing that image in a digital format to be analyzed by an on-board computer. 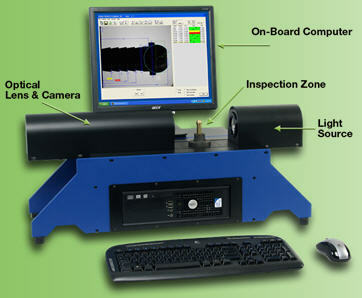 The result: Fast, Accurate inspection of your parts. This fully automated non-contact video inspection system is lightning fast and will simultaneoursly measure multiple dimensions; all in an instant. Our combination of an engineered light source, precision optics, and powerful programming come together to yield an accuracy of 0.0001"